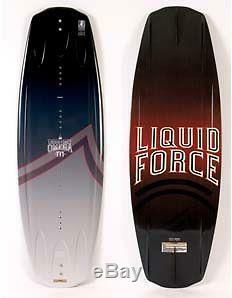 Omega 131 Liquid Force Wakeboard. OMEGA 131 Liquid Force Wakeboard. Note: these have 8 bolt spread, depending on boot, may not have all available stance options. The perfect foundation for progression, the Omega is smooth and simple, just what you need at this level. Catch free with nothing to hold you back. Inspired by a more aggressive board we simply turned down the volume for a consistent and reliable shape made to elevate the masses. Scalloped Diamond Tail - Extended hold up the wake increases the pop off the tail. Variable Edges - There is no catch - Soft in the middle - Forgiving when neutral, spins faster off the wake, land still spinning - Sharpens as it nears the tail - Locks and holds edge into the water when weight is transferred into the edging position. Molded Canted Fins - Easier to get board on edge. Helps the board initiate turns and hold better switch stance, toe-side, and heel-side. Helps create solid and consistent tracking without drag. Mellow 3 stage Rocker - A manageable 3-stage rocker that is fast and consistent off the wake. Sculpted top deck w/ Flex enhancers - Light weight, stiffens snap and response. Fin configuration: Three on each end. One LBC 1.0 center fin and two molded-in side fins. Weight range: 80 - 130 lbs. AK, HI, FPOs and territories will have a surcharge added after the order is placed. We conserve and recycle and try not to waste resources. We are not responsible for fit. The "CloseoutDude" gets all these great Liquid Force factory closeouts. Wakeboards, wakeboard bindings, life vests, jackets, hats, shirts, bags, all new and practically untouched by human hands, just waiting to hit the water. Let "excess inventory" be your new best friend! Huge Discounts on Extreme Sports Gear - Wholesale pricing on Liquid Force Wakeboards, Bindings and Gear. Limited supplies of brand new wakeboard and water ski factory closeouts. The item "Liquid Force Omega 131 Wakeboard NEW" is in sale since Monday, June 06, 2016. This item is in the category "Sporting Goods\Water Sports\Wakeboarding & Waterskiing\Wakeboards". Sculpted top deck w/ Flex enhancers: Light weight, stiffens snap and response.